"There are stories there I wouldn't read"
Digg founder Kevin Rose has admitted he is hugely excited about the role technology is playing in the US presidential election race - telling TechRadar he can't wait to see how much more important it will be in four years time. Speaking at the Future of Web Applications (FOWA) conference in London, Rose admitted that he was surprised at how many political stories are making it into the site's most Dugg category - and at just how skewed things currently are towards Democratic candidate Barack Obama. "I look at the front page and it's wall to wall politics," said Rose. "There are stories there that I wouldn't read." "I think you are right - the stories do seem to be favouring Obama. There are a lot of stories and top 10s right now that are anti-McCain and anti-Palin. "But if you filter the comments... you can see that there are a whole lot of Republicans in there as well voting the pro-Obama comments down. "And it seems that it's the Obama camp using it the most. 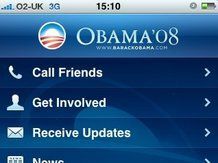 The [Obama] iPhone app is very good."